The first plant visit was a very excellent tool shop called Costamp owned and managed by Mr. Marco Corti, President and CEO. Costamp has been on business since 1968 and has expanded into a modern, well managed company that manufactures molds for die casting aluminum and magnesium alloys. Costamp has a high level of design skills, technical expertise in mold making, and the ability to sample the molds for their customers. At Costamp they have three die casting machines fully automated for the purpose of samples and short production lots. 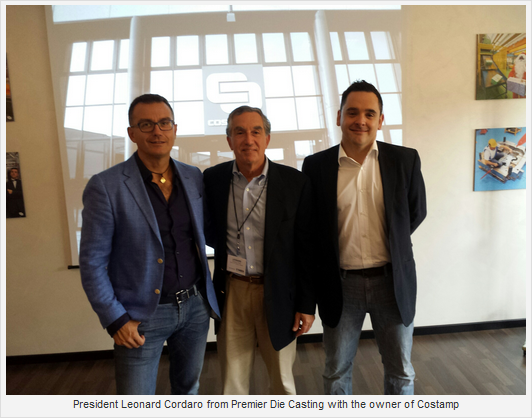 Today Costamp is one of the leading companies in the mold making sector in Europe. After our tour of the plant there was a nice presentation by Meccanica PI.Erre which is a company based in Bedizzole, Italy and other offices throughout the world. Meccanica specializes in manufacturing trim dies, trim systems, trim presses, and specialized secondary machines for the die casting industry. 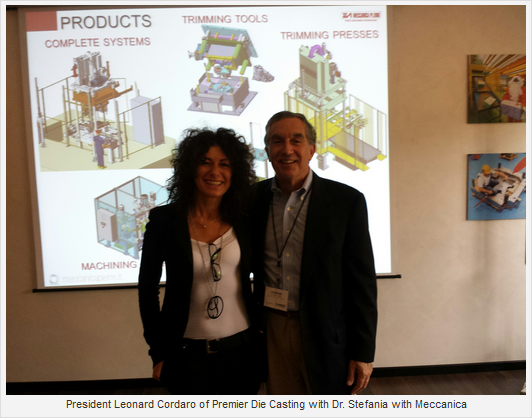 The company was presented by Dr. Stefania Calubini who is the Sales and Marketing Manager. Dr. Calubini has been with the company for 13 years and is driving the business to become a world class provider with many locations around the world. The last plant visit of the day was Buhler Brescia located in Brescia, Italy. Buhler Brescia has a reputation for providing high quality in remanufacturing die casting machines. They have many years experience in retrofitting die casting machines, as well as skills and know how related to the design and construction of die casting systems. You can send you old tired die casting machine to this Buhler location and they will re-manufacture it to new specifications for a percentage of a new machine cost.